The Origin of the Term "Going Postal"
Today I found out where the term “Going Postal” came from. Later that month, on December 31st, the Los Angeles Times published an article The year in review, 1993 in which they stated; “Unlike the more deadly mass shootings around the nation, which have lent a new term to the language, referring to shooting up the office as “going postal,…” It isn’t known who exactly started the phrase “going postal” but what is clear is that it was already a common phrase among Americans at that time. The stereotype was undoubtedly due to several incidents involving postal workers from 1986 to 1993. On August 20, 1986 postman Patrick Sherrill walked into his workplace, shot and killed 14 co-workers and injured 6 more before shooting himself in the head. On October 10, 1991 a former US postal worker, Joseph Harris, killed two employees at a post office in Ridgewood, New Jersey. Then, on November 14th of that same year, after being fired, Thomas Mcilvane killed 4 people and then himself at a Royal Oak, Michigan post office. In a terrible coincidence, on May 6th 1993, two separate shootings took place. The first one was at a post office in Dearborn, Michigan, where Lawrence Jasion killed one person and wounded three before killing himself. Within a few hours of that, in Dana Point, California, Mark Richard Hilbun killed his mother, and then shot two postal workers. It isn’t hard to see from these shootings where the public might get the idea that the postal service had some issues; the media was sure to follow. The postal service itself wasn’t taking a blind eye to the problem and in 1993 they created eighty five “Workplace Environment Analysts” positions. The positions were to help with violence prevention and workplace improvement. This might seem like a win for the Postal Service, but the report also showed some glaring problems. It found that Postal Workers were six times more likely to believe they were in danger from other co-workers; that Postal Workers were less likely to believe their employer would take action against violence by non-employees; and that they were more likely to fear being attacked at work. The most astonishing finding was that workers were more likely to agree that managers and supervisors try to provoke employees to violence. Due to the overwhelming negative viewpoint of these workers, despite the facts, it would seem the postal service had some very poor morale. So while the postal service itself states that there is no evidence to suggest that their workers are more violent than others, American slang took a different view. We now have a very convenient term to use when we see a crazy angry person! Further postal service incidents occurred twice in 2006 where postal workers gave in to the urge to shoot their fellow workmates. On January 30th, Jennifer San Marco killed six postal employees before committing suicide. Then, on April 4th, Grant Gallaher murdered his supervisor in the parking lot of their post office, reportedly because he couldn’t find the postmaster to complain about said supervisor, so he felt shooting her was the next best option. Of the 6,719 workplace homicides from 1992 to 1998, only 16 were postal employees related. Workers in the retail trade are eight times likelier than postal employees to be victims of homicide at work while taxi drivers are 150 times likelier. “Going Taxi Driver” just doesn’t quite have the same ring I suppose. Benjamin Franklin was the first Postmaster General. Peach Springs, AZ, Post Office has walk-in freezers for food destined for delivery to the bottom of the Grand Canyon by mule train. Clinton is the most common Post Office name; madison is the second; and Franklin and Washington are tied for third. The Postal Service has a larger retail network than McDonald’s, Starbucks, and Wal-Mart combined (in US). Once the ZIP code system was put in place, the U.S. Postal Service only required that bulk mailers use the ZIP codes, though they wanted everyone to use them. The Postal Service struggled, in the beginning, to get the general public to start using the zip codes. They eventually more or less decided to give up on convincing adults and instead they created a cartoon character “Mr. ZIP” in order to try to get kids to start using ZIP codes. They figured that the kids would then encourage parents to use the ZIP codes when they saw their parents leaving the ZIP codes out on mail. Further, when the kids grew older, they would teach their kids to use ZIP codes. Mr. ZIP was based on a design by Howard Wilcox, who was the son of a letter carrier. This was a design done for a New York bank that was a child-like sketch of a postman delivering a letter. After AT&T acquired the rights to the design, they made it available to the Postal Service to use at no cost. The Postal Service then made a few minor modifications and Mr. ZIP was born. The term “ZIP code” was originally registered as a servicemark, which is a type of trademark, by the U.S. Postal Service, but the registration has since expired allowing companies like UPS and FedEx to use the term freely. You can actually print the Postnet barcode directly onto your mail piece to make it slightly easier for the Postal Service to sort your mail (mainly skipping the step where they have to scan your mail and print the barcode on it). Many word-processing programs, such as Microsoft Word, include a feature for doing this. Before the 1970s, the United States Postal Service (USPS) was named the United States Post Office Department (USPOD). Interestingly, the ZIP code system was first introduced because the Postal Service was beginning to be overwhelmed with the volume of mail they needed to process in a timely manner, most of which originally was processed by hand. The ZIP code system made a handy way to increase efficiency in that way. However, only a few years after the ZIP code system was introduced in the 1960s, the Postal Service began using the MLOCR system for automatic sorting. Given the address, even without the ZIP code, the MLOCR system is almost always perfectly capable of assigning the ZIP+4 code to the address, with very little mail needing to be human-read to determine the correct address/ZIP code. So in most cases, including the ZIP or ZIP+4 code with the written address doesn’t really increase mail efficiency much at all as the Postal Service’s initial scanning system can come up with those numbers for your written address on its own. The lowest ZIP Code is 00501 in Holtsville, NY. The highest ZIP Code is 99950 in Ketchikan, AK. The easiest ZIP Code to remember is 12345, a unique ZIP Code for General Electric in Schenectady, NY. The longest regular rural route is Route 2 in Gridley, KS. The carrier travels 182.8 miles daily and delivers to 258 boxes. The shortest rural delivery route is Route 42 in Henderson, NV. The carrier travels 2.9 miles daily and delivers to 952 boxes. I was at the post office in Houston (1986) with my 2 year old daughter picking up a package about 20 minutes before the postal employee opened fire on that location. It devastated the entire metro of Houston. I remember not toouch later people using the term “postal” for an angry outburst. A job transfer took us out of Texas in 1991, but it was several years before then that we used “postal” when referring to violent behavior. 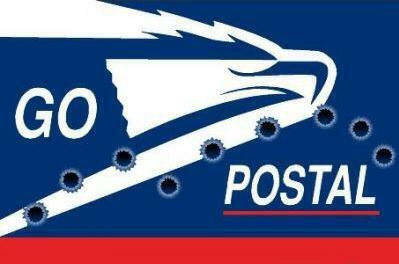 You think working at the post office will drive you mad? At least they pay well for the nonsense. Try working at UPS; wait, don’t. I wouldn’t wish that on my worst enemy. Every job has its nonsense, but this company, especially the main Dallas hub, is run by people who can’t even manage their own lives, let alone people. I wouldn’t be surprised if someone eventually goes “postal” at a UPS or FedEx. And, those poor packages. Don’t ship, unless you must, and always insure. I work at the New Jersey Network Distribution Center 80 County Ave. Jersey City N. J. I have worked there for 18+ years. The supervisor I work for WENT POSTAL on me and put me into a position in which I had no choice but to defend myself. It is because of Postal Workers like this supervisor the term GOING POSTAL came to be. If you want to know the whole story GOOGLE “The Postal Service Has Shown They Are Above The Law” the next to the last story down by Charlie At the NDC the sad fact is: Every one out there pays the price when supervisors like him GO POSTAL and his friends in management and in the union try to cover what they do up. I have been on suspension for over 2 years. These managers, supervisors and union representatives involved are trying to get me to resign of mine own accord. But I will never resign because it was this supervisor that attacked me. But rest assured these managers, supervisors and union representatives will spend as much of YOUR MONEY as it takes to find a way to remove me from the Postal Service even if it takes 10 years. So when the price of stamps goes up and the quality of service goes down you know why. Have a Blessed Holiday Season. Merry Christmas. I worked for the Los Angeles Pigeon-Hole Jungle (a.k.a. Postal Service for nine years in the ‘sixties and ‘seventies. First, “ZIP” stands for “Zone Improvement Program”. In 1966 I submitted an award-winning suggestion to change the labels over mail drops in city branch offices from “Zoned” and “Unzoned” to “Coded” and “Uncoded.” Second, I was working there in August 1970 when a supervisor named Harry Sendrow was gunned down at the entrance to the Terminal Annex – then the main 7-24-365 postal facility in Los Angeles. The perpetrator had been sent home either inebriated or drugged, but in any event intolerable and returned gunning for the General Foreman who had sent him home. Unable to confront him, he instead killed Sendrow, the line foreman who had been dispatched in his stead. Having sent the last ítem above and since read the one preceding it, I was reminded of an effort by a line foreman to provoke me to violence. At the end of a tour one night in June 1967, Ronald Dunlap, a supervisor at the Los Angeles Post Office, having earlier participated enthusiastically in an effort to effect my removal on trumped-up charges of fondling a female employee, engaged me in apparently innocuous, low-level (decibel and otherwise) conversation in which he repeated a question to which I had already answered “yes”, suddenly began stalking toward me, eyes shooting flame. “Don’t you ever shout at me, Brackney”, he railed. “Don’t you EVER shout! ‘Cause I’ll get you OUTTA here!” Other employees looked on anxiously, expecting violence. I thrust both arms behind my back, locking each forearm in the opposite hand and backed resolutely away. If he had failed to effect my removal on the fakery of the earlier charges, he must now fail to provoke me into raising my hand to him. This was only one of many instances which led to my ultimately leaving not only he USPO but the US in 1972.